Hi guys. 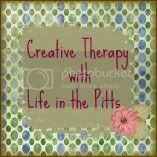 It's Wednesday, and that means it's time for our Creative Therapy session. I've had a rough week. You may have guessed that from yesterday's post. It may sound funny, but these sessions really are therapy for me. I suffer from depression. Many of you probably do too. I went through a period when I fist moved out here where I was sleeping for 12-18 hours every day, and rarely leaving the house. I was sad and lonely and you know what helped? Blogging. And reading blogs. Finding this amazing network of women. Reading your stories got me back on my feet. And then finding craft blogs. Being motivated to try making things myself. I began getting up out of bed, showering, and going to the store to get supplies. I stopped daydreaming about dying. I started living again. That's what blogging did for me. So when things get tough, and I can't stop crying, I know that even if my sisters aren't answering their phones, I don't have to feel isolated and alone. Because when I turn on my computer, I turn on a lifeline. I can visit your pages, and hear about your struggles, and be inspired by your triumphs. It's a resource my mother never had. And when I see the projects you crafty people make, and it gets me excited. I can't tell you how valuable that is. And welcome to our Creative Therapy Session. 1. Make sure you link directly to the page your Creative Project is on, not your main blog page (please, no Etsy Shops or online stores). 2. Leave a short description of your project. 3. Grab my Craft Therapy button, and put it somewhere visible. Or you can just create a link back. I'm not too picky. 4. Visit the person above you in the Linky list, and leave them a comment. And if you'd like to visit a few more people, that would be great, too! The linky will close at Midnight, so be sure to link up before then. And if you don't get your project done on time, don't stress. Enjoy the projects that were linked up, and participate again next week. Thank you for sharing your experience, you rock! Thank you so much for hosting! I so treasure my blogging friends, it is so nice to be able to escape reality for a while! I have panic attacks so I can related. Being able to blog and see all the wonderful things being created in blogland, has brought my creativity back and I love it! And it has helped with my panic attacks. Thanks for sharing your story! LOOOOVVVEEEE the new button! It is therapy for me too so thank you. I haven't had anything to show lately though. I really need to take time to craft. I have bipolar II and complex PTSD, and manage both by crafting - I had a breakdown last year and when all I could do was knit I'd joke that I was 'knitting myself back together'. It was true though, with every stitch. Thank you for sharing about your depression! I too suffer from depression and acute anxiety. There are many days when it takes all the effort in the world to pull myself out of bed. Blogging is a huge help to me! When I was at my lowest last year, crafting and decorating was what brought me out of it. i have been depressed and it sucked. i cant even waych the stupid commercials that talk about depression meds because i remember feeling like that. but this will cheer you up-i gave you an award on my blog. yup-like it or not, you got one! I just wanted to take a moment to say thank you for writing a beautiful post. I love reading your posts and I always get a laugh, as I'm sure your hubby must day in and day out. You bring joy to others through your blog, so you are doing positive work by brightening your life as well as others. Losing people is hard, but losing someone too soon is even harder, especially a mother. Hang in there girl! You are a beautiful person and I can tell through your posts that you are love by many. So know that you are not alone in your struggles, and never lose hope. Always come back to your blog for comfort. Hell, you can email me any time you want if you need a shoulder to cry on :) Lord knows it helps! While my entry is not your standard project I do so hope it will inspire. I am so glad you found something too that makes you happy!!! Thanks so much for hosting each week! I lost my brother almost 4 weeks ago and the outpouring of support for the blogging community has been overwhelming. My brother was 49, too young to die. Now, I am an only child. Hey! I visit your CT post every week -well, I follow your blog, so...anyway, I've yet to post, but I really find it uplifting! I'm glad that this helps pull you through! I don't know why but I didn't realize that you suffer from depression, but it's wonderful that you have found something that is therapeutic and you enjoy! I started blogging when I moved to a new city, with a new baby, staying home for the first time and didn't know anybody. Starting to take on little DIY projects has helped to give me something to do, so that I don't feel like my brain isn't engaged in anything but motherhood, and also some lovely people to show it off to that don't think I'm just bragging, but can rejoice in my successes with me. Doesn't it just make your day when someone you have never met tells you how cute something that you've made is? What a great thing blogging can be! I'm so glad that you found something you are passionate about and makes you happy. Depression is hard. I have had many family member's and friend's who have struggled with mental health disorders. I am so sad to hear about your mom. I can't even begin to understand what you and your family have gone through. We are all here for you. Your blogging community. Girlllllllllll.....email me whenever you feel ick k? I swear you could have taken that post right out of my head....that was ME exactly when we moved out here.....my *dear and patient* hubby finally dragged my by my pajama bottoms and dropped me off at the doctor's office and said "GO TALK, please?" Yes, I so get it!!!!!!!!!! !